Thank you for your interest in having our premium pet foods delivered to your door! Please enter your postal code below to find your Homeward Bound Pet Food Delivery franchisee! We've searched, and found your nearest Homeward Bound Pet Food Delivery franchisee! Oops! Something went wrong while submitting the form. Please try again, and reload the page if it still gives you problems. Sorry! Contact this Franchise - fill out the form below! Your information will be sent to your local Homeward Bound Pet Food Delivery Franchisee who will contact you to make delivery arrangements. You'll hear from us soon! Oops! Something went wrong with the form, please make sure you have completed all required fields and try again. 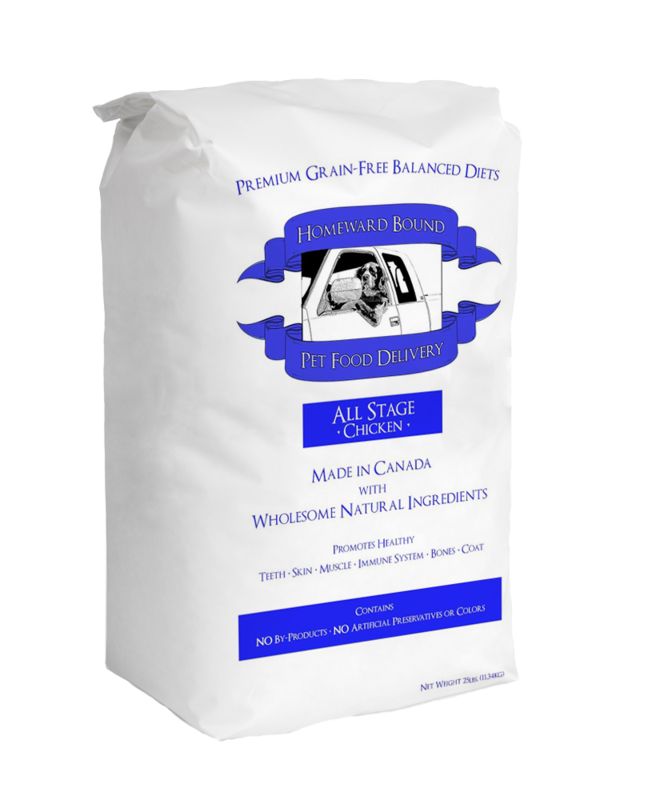 Our Homeward Bound Grain Free All Stage Chicken recipe features a well-balanced diet suitable for dogs of all ages, sizes, and breeds. Our recipes are made in Canada with farm-fresh natural ingredients including protein-rich chicken that will provide your dog with the exceptional nutrition and endless energy it needs to live a healthy and happy life. *Pricing may vary depending on region. Click on Find Your Franchise to get pricing in your area. All dogs are different so amounts will vary depending on breed, age, activity level and climate. Use the feeding chart as a guide to achieve your dog's ideal weight. Puppies 1 1/2 to 3 months feed twice adult amount, 3-6 months feed 1 1/2 times adult amount, and 6-11 months feed 1 1/4 times the adult amount. Gestation increase by 25%-50%. Lactation, feed free choice. Serve dry or slightly moistened. Keep bag sealed. Store in cool dry place. We recommend feeding twice daily and always have fresh, clean water available. Start by mixing 25% of HB with 75% of old food on day 1, and gradually increase the proportions till feeding 100% HB by day 7. The HB All Stage Chicken Dog Food Recipe is formulated to meet the nutritional levels established by the AAFCO Dog Food Nutrient Profiles for all life stages.